After completing Marianne’s 200 Hour Yoga Teacher Training in April, 2013, Jamie Fox slowly began shifting her goals and priorities in order to live a life more true to who she was. Shortly thereafter, Jamie started making jewelry and starting her own company, Live True Designs, as a way to create balance and explore her creativity. She finds inspiration in the sea and the deep eternal beauty of nature surrounding her studio in British Columbia. Her collection of jewelry and tote bags are deeply meaningful and intentional and each one of her hand made mala necklaces are hand knotted between each bead and have 108 gemstones, or beads, or a combination of both. Jamie offers custom Mala and jewelry and has worked in collaboration with Marianne to make Marianne’s Custom Mala Necklace. 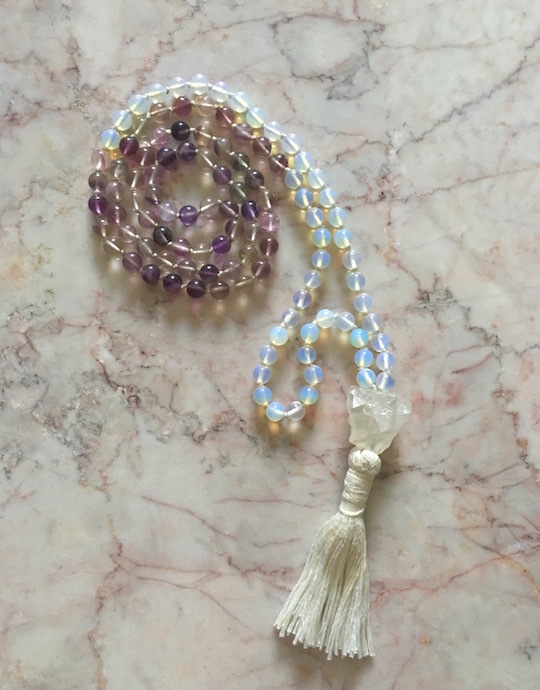 Marianne specifically designed her Mala necklace to incorporate the number 23, a sacred number in numerology and one that is very special to Marianne. Marianne’s son Jimmy was born on the 23rd of April, left this lifetime on the 23rd of November, and communicates with Marianne through the number 23. Additionally, Marianne has 23 yoga asanas in her 200 Hour Yoga Teacher Training Manual, which is no coincidence at all. The number 23 is also believed to represent qualities and characteristics such as balance, faith, trust, joy, optimism, self-expression and creativity- all of which are foundations of both Marianne’s philosophy on life and teaching others through Marianne Wells Yoga School.